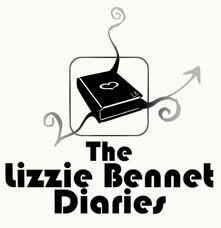 Mondays are infinitely more tolerable with the promise of a new episode of The Lizzie Bennet Diaries, a vlog series reinterpreting Pride and Prejudice for the Confessional Age. This week we’re all waiting breathlessly for word of what will happen to Lydia now that George Wickham has used and abused her. In December I wrote about the charming web series, which recasts the gentleman’s daughter in precarious financial circumstances as a SoCal grad student -- in precarious financial circumstances. Between student loans and the Great Recession devaluing her parents’ house Lizzie and her sisters are facing a crisis. And as her mother prattles on about averting disaster by finding rich husbands, Lizzie soldiers on gamely vlogging her life as her master’s thesis project in communications. The series was already a big hit by internet standards – more than 140,000 subscribers -- and it’s getting a much-deserved boost with mentions in stories commemorating the 200th anniversary of P&P on January 28. Episode 1 has more than 700,000 hits.